Diving opens up new worlds of work and play. Divers plunge underwater to build bridges, conserve marine life and solve crimes. Some make movies and hunt treasure, and many dive to gather seafood. Māori dived without any breathing equipment to collect seafood. Later divers used snorkels and facemasks. In the 1800s diving with oxygen began. Divers wore a heavy helmet with a long hose attached to it. From the surface, air was pumped through the hose into the helmet. Around 1942 the aqualung was invented. Divers wore tanks on their backs, and a controlled amount of air flowed from these into the mask. These scuba divers could swim freely underwater. Scuba diving can be dangerous, so divers have to follow safety rules. If they don’t, they can have problems such as decompression sickness or ‘the bends’. Divers observe animals and plants in the ocean, at artificial reefs such as sunken ships, and in freshwater caves. While there, they can photograph or film underwater life, and many catch fish and crayfish. Some divers go fin swimming (using a snorkel and one fin over both feet), others take part in races, and some see how deep they can dive without breathing gear. Many divers go spearfishing. Underwater hockey is also a popular sport in New Zealand. Divers help build bridges, put equipment in harbours, install underwater cables and check dams. They also help recover sunken ships, stop oil leaking from them, and recover treasure. Police divers recover bodies and items that help solve crimes. 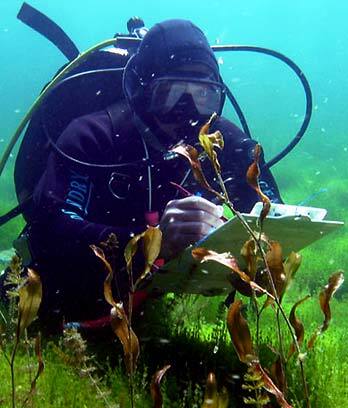 Divers help scientists by collecting plants and animals, counting fish, checking the growth of plants in lakes, and finding out about sea life in the Antarctic. Some divers were active in advocating for marine reserves, which have been set up in parts of the country to protect the sea life.